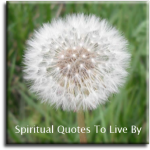 These peace sayings are all positive words of inspiration from unknown authors, quotes from known authors are on the Peace Quotes page. A gentle Angel is always there to chase grey clouds away, and bring you peace and comfort to each hour of every day. 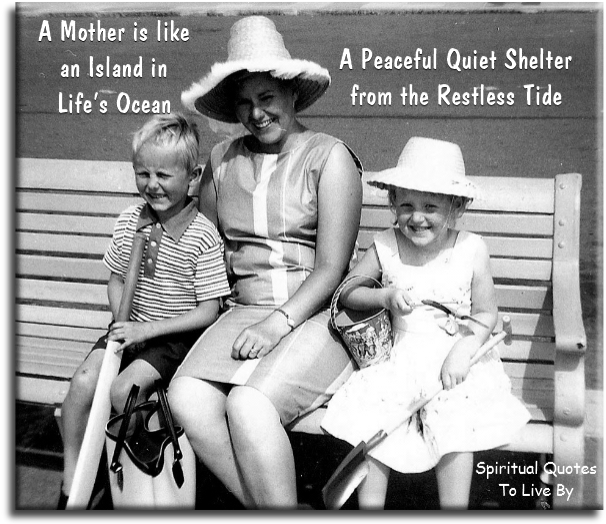 A mother is like an island in life's ocean, a peaceful quiet shelter from the restless tide. A peaceful Spirit is one that is in harmony with itself and the world around it. I pledge allegiance to the Earth and to all Beings who inhabit it, and to the planet for which it stands. One World under Love, Indivisible, with Peace and Liberty for all. If I cannot find peace within myself, can there be peace in this world? If there be righteousness in the heart there will be beauty in the character. If there is beauty in the character there will be harmony in the home. If there is harmony in the home there will be order in the nation. Let peace be a part of you. I honour the place in you in which the entire Universe dwells. I honour the place in you which is of Love, of Truth, of Light and of Peace. When you are in that place in you and I am in that place in me, we are One. Parental evolution is the solution. 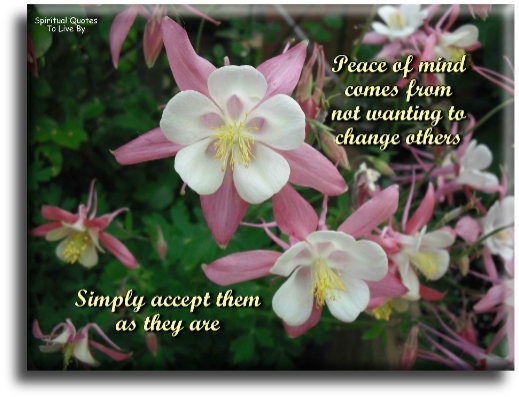 Peace of mind comes from not wanting to change others, simply accept them as they are. Peace... it does not mean to be in a place where there is no noise, trouble or hard work. It means to be in the midst of those things and still be calm in your heart. The greatest thing in life is love, to give and to receive. A life of love and joy and peace, is the ultimate to achieve. Trust in your Guardian Angel and you will surely find, that you'll feel loved and protected and will have peace of mind.